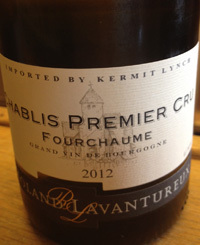 2012 Domaine Roland Lavantureaux, Chablis “Fourchaume” Premier Cru White Burgundy, France. Wow, I am thrilled by the Lavantureaux 2012’s, I have always admired the quality of this Chablis house, especially their Petite Chablis, but these 2012 wines are spectacular and utterly delicious with verve and depth. Kermit Lynch has been the long time importer of Domaine Roland Lavantureaux and they have been a steady performer for decades making a solid and correct lineup of Chardonnay with pure regional character, but this 2012 Fourchaume Premier Cru is something far beyond the normal fare, this is on another level entirely, this is a sleeper and I highly recommend rushing down to your local wine merchant and getting yours reserved as soon as possible, it should be in stock now or very shortly. The 2012 Domaine Roland Lavantureaux Chablis Fourchaume Premier Cru starts with a hue of green/yellow and a nose of wet stones, citrus blossoms and lime leading to a surprisingly full palate of citrus/lime essence, green apple, white peach and has a steely core with chalky mineral, clove spice, hazelnut and lemon oil. This wine is balanced, harmonious and vibrant with wonderful intensity/tension throughout, this is a stunning Chablis, by far the best wine from Lavantureaux I’ve had, if you are looking for a top Chablis at a super fair price this is it, no question, drink from 2015 to 2020, absolutely gorgeous.